Legislative Affairs and later became Chief-of-Staff. The FMC receives complaints and offers alternative dispute resolution services (ombuds assistance, mediation and arbitra- tion) in attempt to reach a timely settlement and has adminis- trative law judges (ALJs) who issue binding decisions. Doyle says, “We act as an appeals court per se, and rule on decisions made by the ALJs and consider appeals of ALJ decisions. Administration and Canada’s National Energy Board. And, he was selected by the U.S. Department of State to participate in an international shale gas workshop to assess international resources, supply options, and market conditions. Processing (OPVIP). OPVIP receives and reviews applications from passenger vessel operators (PVOs) for Certifi cates (Per- formance) and Certifi cates (Casualty) and the associated cover- age evidencing acceptable forms of fi nancial responsibility. In this case, the Certifi cate (Performance) indicates that the PVO has fi led acceptable evidence of fi nancial responsibility with the Commission. The coverage is used to reimburse passengers when the PVO fails to perform cruises as contracted and has taken no further actions to refund passengers. The Certifi cate (Casualty) indicates that the PVO has fi led acceptable evidence of fi nancial responsibility with the Commission which can be used to pay claims for death or injury to passengers and other persons on voyages covered by the program. 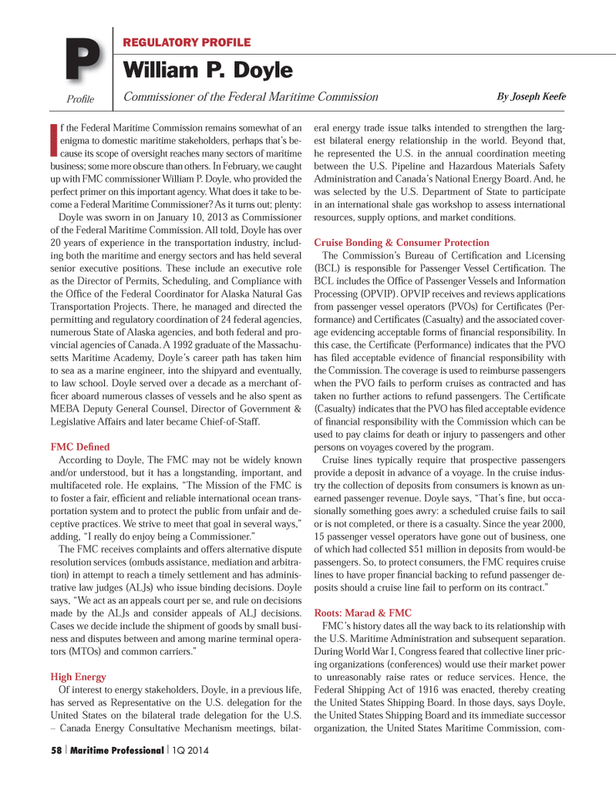 FMC’s history dates all the way back to its relationship with the U.S. Maritime Administration and subsequent separation.